Our celebration of Father's Day -- Dad's special time -- continues. 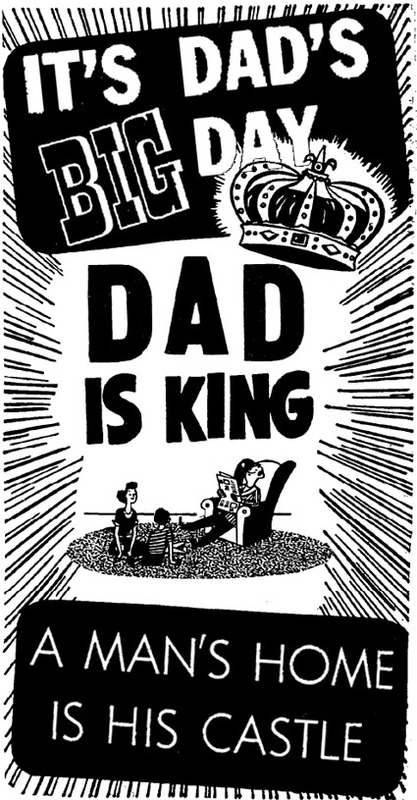 We're spreading the word that "Dad Is King!" We have crowned him such on his big day. It's great to see him sitting back in his easy chair with the rest of us lovingly gathered around. I like watching my dad read the Sunday paper, the thick king-size edition they put out every week, truly fit for a king. I love the expression, "A man's home is his castle," because it says it so perfectly, what I myself have always thought. Because if you can't rule and reign in your own house, where can you? It's only natural that a man would want that. So Dad's got it exactly right. Happy Father's Day, Dad! We love your benevolent rule, your mercy when we approach your throne with entreaties, and especially how great you've always honored your Queen, our mother. Enjoy your special day, our liege. Sincerely, your Princes and Princesses.